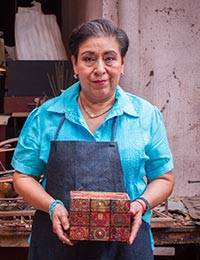 Highly revered and beloved by the Mexican people, the Virgin of Guadalupe inspires Ana Maria Gonzalez to create a collection of decoupage crosses in her honor. In 1999, Pope John Paul II named Our Lady of Guadalupe patron saint of the Americas, and she is celebrated on December 12. Her well-known image miraculously appeared on the Saint Juan Diego's robe, where he was carrying Castilian roses as proof of her appearance to him. Guadalupe sent him to the Spanish bishop to convince him to a build a church in her honor. In this cross, Guadalupe is welcomed into Heaven by God and His angels.